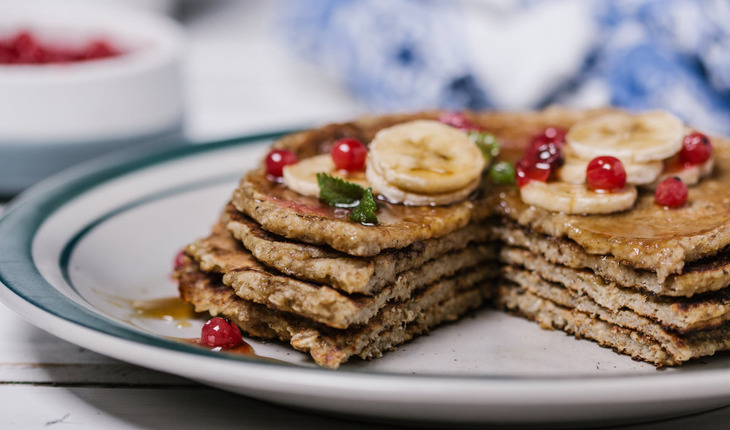 A unique + healthy twist on a breakfast favorite – these pancakes are not just scrumptious, they are nutrition-packed too! In a small saucepan, bring 2 cups of water to boil, then add lentils and cook for 15-20 minutes, until soft. Drain well and set aside. In a large bowl, stir together the oats, flour, brown sugar, cinnamon, baking powder, baking soda, and salt. In a smaller bowl, whisk together the yogurt, milk, oil, eggs, and vanilla, then add to the dry ingredients, along with the banana and lentils, and stir until just combined. Set a heavy skillet over medium heat, add a drizzle of coconut oil and wipe it around with a paper towel to coat the bottom of the pan. Cook about ½ a cup of batter at a time, spreading it out with the back of a spoon if needed (it will be thick). Cook for a couple of minutes, until bubbles begin to break through the surface and the bottom is golden. Keep the heat to medium, as these will take longer to cook through that most pancakes, and you do not want to burn the bottoms. Flip with a thin spatula and cook until they are golden on the other side, and springy to the touch. Keep the pancakes warm on a rack set on a baking sheet in a 250°F oven while you finish cooking the rest. Serve drizzled with maple syrup (optional). Walnuts are a delicious addition to this recipe.